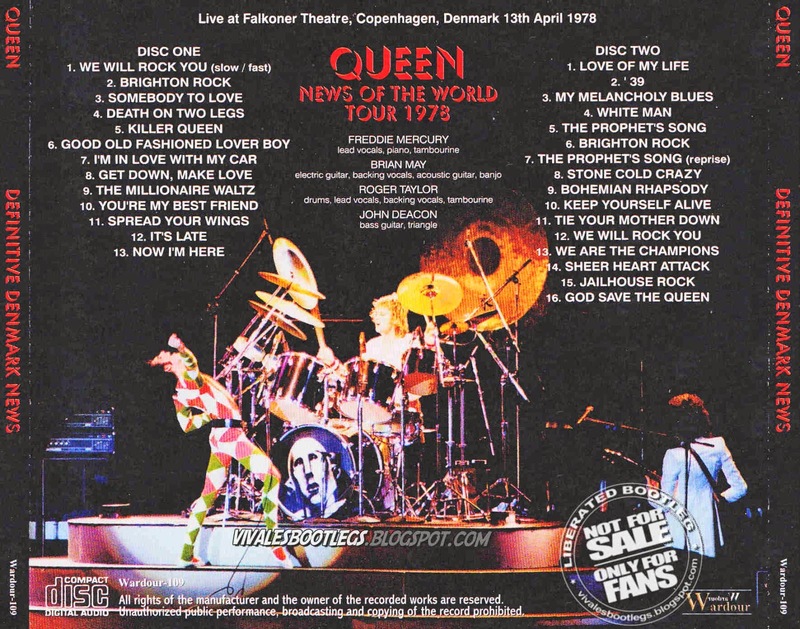 Recorded Live at Falkoner Theatre, Copenhagen, Denmark - April 13, 1978. Excellent- Audience recording :: Silver CDs :: FLAC. Files: 29.:: Size: 631,68 MB (flac). Personnel: Brian May – lead guitar, vocals / Roger Taylor – drums, percussion, vocals / Freddie Mercury – lead vocals, piano / John Deacon – bass. Notes: Some years ago surfaced the cleanest version of the Copenhagen audience recording. The tape runs a bit fast, though. 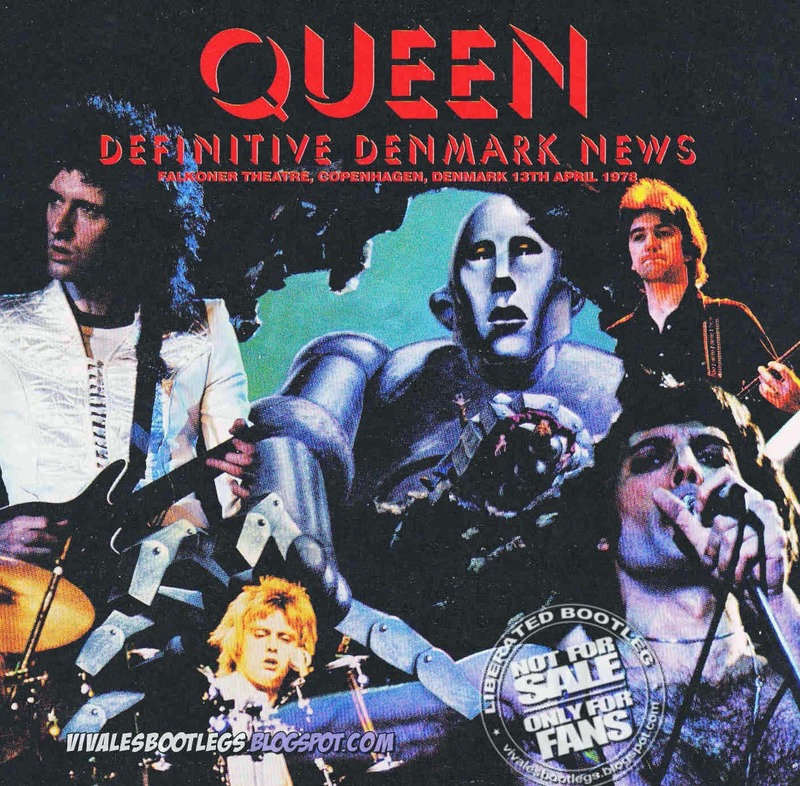 In 2007, Wardour bootlegged that version that had been freely available for download a few years prior in "Denmark News". Wardour bootlegged the show again in 2013 (this Wardour silvers), very likely using the same source tape. It seems it has only been EQ'd to bring out the top end, and the tape's speed has been corrected. Queen waited four months between ending the News Of The World North American tour before playing in Europe. The first show was in Stockholm on April 12th and was released on the silver title Big Disgrace (GE-254/255) on Gypsy Eye, one of their last titles before converting into the cdr label Breakdown. The second concert of the tour at the Falkoner Theatre in Denmark is presented on Denmark News, one of two recent Wardour releases from the first two weeks of this tour. Denmark was released previously on Rock ‘n’ Roll, Tonight, Okay!! on Gypsy Eye (GE-123/124) which uses a high generation copy of the common tape source. Denmark News uses a source closer to the master and sounds much more full with more dynamics. It is a significant improvement of Gypsy Eye. There are several very small cuts on the tape after “Spread Your Wings”, “The Prophet’s Song”, “Tie Your Mother Down”, “We Are The Champions”, and “Sheer Heart Attack” but no music is lost. Perhaps the taper was checking the tape between songs. There is also a slight tape wobble during “We Are The Champions” and the encores. Some claim this is the best sounding tape from the entire European News Of The World tour that exists. The venue is small and wasn’t sold out (Freddie complains about the latter during the show), but helped the taper produce a highly enjoyable tape with a wonderful live sound to it. The set list for the spring tour was similar to the North American tour. “It’s Late”, which was rarely played before, now became a regular inclusion replacing “Liar”, which would only appear in the second Rotterdam and first London concerts. “Now I’m Here” on the earlier tour was segued directly with the guitar solo with no return to “The Prophet’s Song”. In Europe it has been moved to before the short acoustic set and played as an independent number with the guitar solo returning to “The Prophet’s Song”. Being the second night Freddie is in great voice (Info taken from queenlive.ca). Lineage: Definitive Denmark News (Wardour) CD --> WAV (with EAC) --> Flac level 8 (with XRECODE).